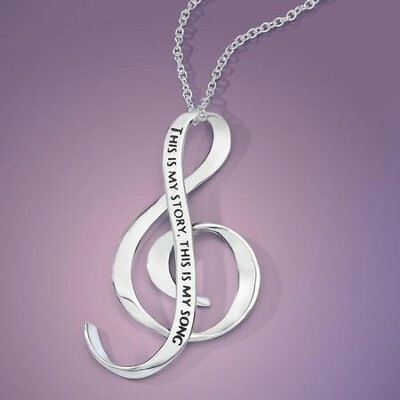 Sterling silver G-clef necklace is perfect for the music lover. Inscibed on front with, This is my story, this is my song; and on the back, Blessed Assurance. 1.5" pendant hangs on a 18" sterling silver chain with clasp; crafted in the USA. Gift boxed. I'm the author/artist and I want to review Blessed Assurance, Sterling Silver, G-Clef Necklace.